The first time his father disappeared, Tucker Feye had just turned thirteen. The Reverend Feye simply climbed on the roof to fix a shingle, let out a scream, and vanished — only to walk up the driveway an hour later, looking older and worn, with a strange girl named Lahlia in tow. In the months that followed, Tucker watched his father grow distant and his once loving mother slide into madness. But then both of his parents disappear. Now in the care of his wild Uncle Kosh, Tucker begins to suspect that the disks of shimmering air he keeps seeing — one right on top of the roof — hold the answer to restoring his family. And when he dares to step into one, he’s launched on a time-twisting journey— from a small Midwestern town to a futuristic hospital run by digitally augmented healers, from the death of an ancient prophet to a forest at the end of time. Inevitably, Tucker’s actions alter the past and future, changing his world forever. Pete Hautman is an author of variety. From tales of boy meets girl to frozen wasteland penitentiaries, to his newest with time travel and evil brewing beyond a hidden veil, Hautamn can do it all. 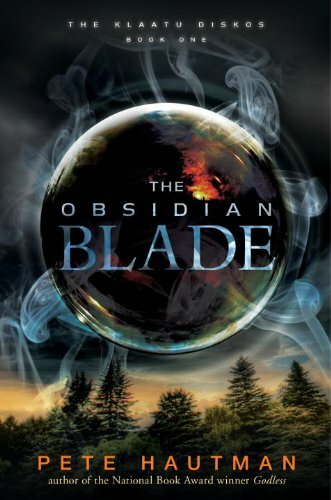 The Obsidian Blade is complicated. It's science fiction...sometimes that happens. Complicated isn't necessarily bad, it just takes some work. In a post-apocalyptic, post-digital world a discorporeal, ghost-like artist dreamed of a technology that would allow her discorporeal, ghost-like brethren to visit important times in the past to connect them to their humanity. But opening a portal in one time leaves it vulnerable to another. Tucker had no idea what lay beyond in the shimmering, ethereal disc that his father disappeared into, but it would change his life and his destiny forever. Like most trilogy starters, world building can be difficult and putting the plot into context can be even more difficult. Hautman stumbles a little, but redeems himself as the pace picks up and the story truly reveals itself. Tucker is in quite a strait at the end of book one and with evil futuristic priests and crazy parents on the loose, the wait for book two will be difficult.